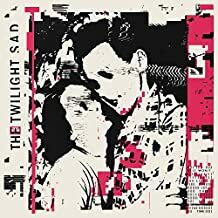 The fifth album from The Twilight Sad, prime exponents of big sweeping soundscapes and playing out of emotional traumas. Describing themselves as a ‘…Scottish band who enjoy making miserable music…’ they share some musical territory with the Cure, including support slots on their tours and a Robert Smith vocal cover on one of the Sad’s best songs ‘There’s A Girl In The Corner’. Everything is in place on this new collection; illustrated perfectly in the first song (10 Good Reasons For Modern Drugs) from the opening line ‘…we’re hanging on by a thread and you keep bowing your head…’ to the big glorious sound when the full band kicks in. There are many cryptic titles along the way such as ‘Shooting Dennis Hopper Shooting’ with one of the heaviest introductions to a percussion driven piece. ‘The Arbor’ is dark and thoughtful, with a repeating guitar triplet figure and super deep bass. ‘VTr’ was a trail single for this album; an uptempo almost optimistic sounding song with one of the best vocal performances on this album. ‘Sunday Day13’ is a slower impassioned track ‘…will you always be mine?…please don’t ever change your mind…’, heart wrenching lines over mixed keyboard backing. The echoing piano drifts away to herald another previous single ‘I’m Not Here (Missing Face)’, an epic, unrelenting pulsing rhythm, sustained guitar notes and a catchy but pessimistic hookline with various versions of ‘…I can’t stand to be around you any more….’. The sentiment continues in ‘Auge/Maschine’ ‘…I can’t believe you’re happy…’, a brilliant song powered by huge skysaw guitar. ‘Keep It All To Myself’ is a lighter, quick waltz and probably the most immediate song on the LP. And there are three more excellent tracks too; it is a superb collection, an intense, demanding listen in one go but unearthing treasures and extra depth as you accept it into your consciousness. This entry was posted in Music and tagged album, CD, LP, review, Twilight Sad on February 6, 2019 by iknoweno.